Unless a cafe or restaurant has A+ street frontage they can’t just rely on impromptu customers to maintain adequate sales. Instead, they need to be more proactive to attract customers. Of course, most owners know this but their execution when it comes to their marketing efforts is limited. When considering what makes for effective marketing consider the typical customer of today compared with 10 years ago. Three of the biggest changes is the growth of online review sites, heightened expectations and a shift in culture toward eating out and the social capital associated with it. These behaviors and trends translate into patrons putting more value and investment into their eating experiences. Below I’ve included 5 ways that eateries can adapt to these 3 customer behaviors to boost their marketing game. In turn, garner more customers and more sales through developing a more appealing and visible brand online. Effectively managing online reviews is not just about responding to negative ones it’s also about diluting them. From observation, it seems like managers have caught on to the need to monitor and reply to online reviews. But just replying to reviews is a reactive approach to managing reviews. This means that staff wait for bad reviews, and then mitigate them as best they can with often lengthy replies. In this example, a hotel has created custom cards to provide parting customers with to encourage them to post reviews on TripAdvisor. Instead, continue to do this, but also adopt a proactive approach and encourage satisfied customers to leave reviews. Asking for reviews is the best way to do this and it’s something that review sites encourage. TripAdvisor and many others offer review cards that can be ordered off their respective sites. Another method is asking for reviews on your social media presences. This might seem like a high-risk approach but brand detractors that leave bad reviews normally do so in the first 24 hours of their experience. Whereas social media followers just by being fans have demonstrated that they have a natural or favorable view of your business. An example showing which review sites to ask social media fans to post reviews to in order of priority. Adopting a proactive approach to getting reviews for your eatery online also has the added benefit of enabling you to improve your ratings on whichever review site has the lowest rating. If your cafe has great rates on all sites, prioritise whichever review site has the least amount of reviews as these are the most vulnerable to being influenced by 1-star ratings, in this case, Facebook. What’s your cafe or restaurant’s target demographic? Most eateries are only active on one social media platform, and that platform is normally Facebook. It’s often a logical choice and it’s also a convenient one because it’s the social media platform most business owners and staff are familiar with. Facebook also has the most diverse demographics of any social media platform. While Instagram has the advantage of being visually oriented, a characteristic that lends itself to the visual nature of food. Reach and engagement is also typically much higher than on Facebook or Twitter. Generally speaking, avoid posting native content to Twitter, its user base is very small globally but even more so in Australia. Instead, pick a primary social network like Facebook and then push out content to other social networks via a free service like Buffer. Every business should claim ownership of any of the listings for its cafe or restaurant that show up in search results for their business. At the top of this list is your Google My Business Listing. Why does it matter? For a lot of little reasons but the biggest is making sure that your menu and opening hours are up to date. 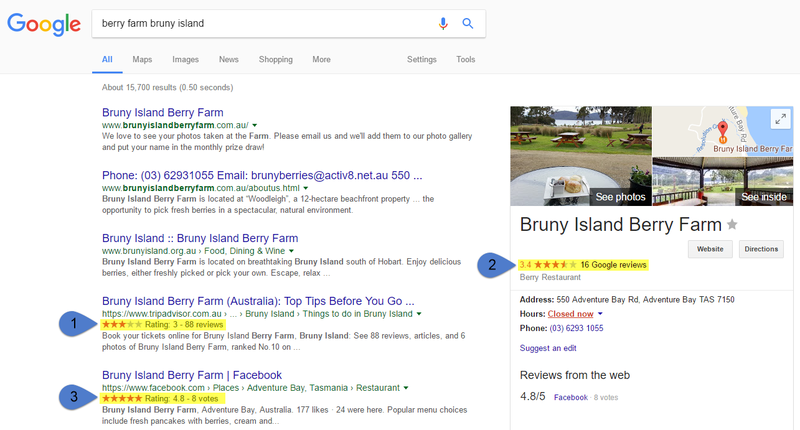 In the case of Google My Business not keeping your listing up to date will result in customers that google your business being given the wrong details on the right-hand side of their search. The end result? A very annoyed customer. Every cafe and restaurant should have a great website that adds to the customer’s experience. But at the same time, some customers don’t expect a great website for every place that they eat it, a bad one doesn’t necessarily detract from their view of your business. It’s just a lost opportunity. In this example, the default SEO description references the underlying Content Managment System (CMS). But one thing that is a cause for concern is poor SEO titles and descriptions. As this is the text that people read describing your business in search results. It’s going to result in your business being penalised by search engines so that fewer eyes see your business and its going to come across as shady by potential customers. If a website designer is left to their own devices they will have to improvise to get your website complete in the absence of being given images by you. The same can be said for those that managed social media accounts. 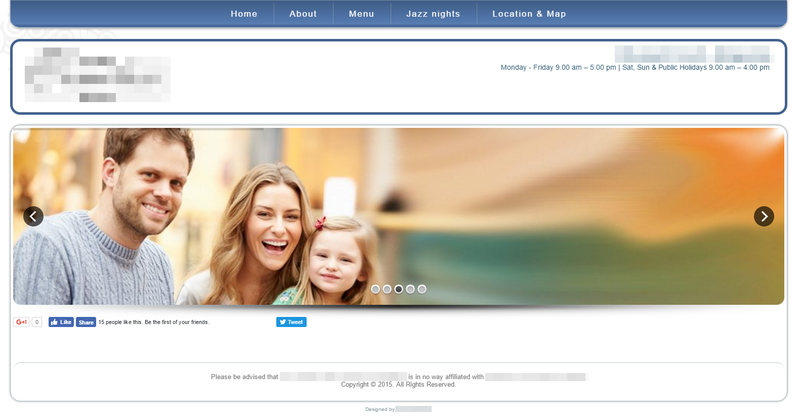 An example of one of many generic images being used for a cafe’s website. Note that the image could be used for almost any website. This may seem harmless and for some customers, it may well be. They will sense that the images are generic and your business will not look authentic to them. They are going to like the look of a dish shown on your website or the atmosphere that images convey, only to be disappointed when they see the real thing. Does your business suffer from one or more of these mistakes? Thank you for taking the time to read this post, I hope it has delivered you value. If you would like assistance managing your cafe or restaurant’s online presence get in touch with us today to get a 30% discount for the first 3 months.